The rhythm trio is a well-established and ubiquitous format in jazz. Its fluidity and flexibility allow for a wide range of expression from traditional to advanced with the majority of recordings being solidly in the mainstream. 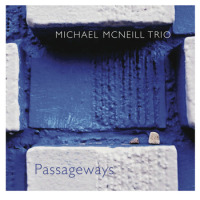 Pianist Michael McNeill's exhilarating and innovative debut recording Passageways pushes the harmonic boundaries of the ensemble into unique and intriguing territories. The classically trained Buffalo native leads his intimate group through five of his own originals that allow ample room for spontaneous creativity. "Prelude-Metropolis" for instance, opens with McNeill's unaccompanied, modernistic and sparse, sonata that climaxes into an impromptu burst of note clusters before it ebbs into carefully placed chimes that echo in silence. The entry of the other instruments, a delightfully dissonant pizzicato double-bass and edgy, polyrhythmic drums, add a dramatic atonality to the composition. This motif of subtle theatricality runs through the record. On "Nobody's Waltz" the abstract, three-way conversation builds into an introspective interlude. McNeill's gently percussive keys, bassist Ken Filiano's stimulating arco drone and drummer Phil Haynes' crashing cymbals fill the silence with stimulating sonance. Filliano's baroque-esque bowed strings have a wistful melodicism, as he flirts with the avant-garde on "Hold On," the longest track, comprising almost half of the album. 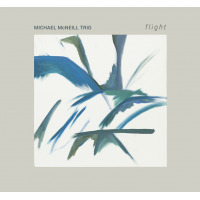 McNeill's free-flowing piano carries a certain intelligent mystique, as its percolating lines echo against Filliano's carefully scattered strings and Haynes' delightfully eccentric thrums and beats. The tune evolves into a more conventional boppish workout that nevertheless maintains a healthy angularity. Haynes' vaguely eastern solo, with its thunderous barrage of alternating trap and bass drums, ushers in an expectant mood on "Exit Now." His subsequent, bright cymbal taps; McNeill's cascading tones and Filliano's passionately lilting improvisation innovatively deconstruct this contemplative and thrilling piece, bringing it to a bracing conclusion. The camaraderie among the band mates, however, is best heard on "I'm OK Now"'s collective extemporization. The melancholic song shimmers with muted hues as the musicians weave an elegant and poetic nocturne. With PassagewaysMcNeill has burst on the modern music scene as an exciting and ingenious composer and improviser. His more seasoned associates, far from overshadowing him, enhance his singular vision. Hopefully this gem of a disc will serve as an introduction to a luminous career.